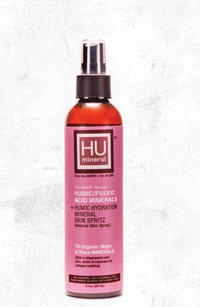 Humic/Fulvic Acid Minerals Skin Spray, 8 fl oz (HUMineral) - Penn Herb Co. Ltd.
HUmineral™ refreshing Hydration Mineral Skin Spray delivers raw plant humate nutrients nourishing face, skin, hair and total body. It may reduce signs of wrinkles, lines, sunspots. Can use for rash, moisturizing, toning, weathered skin. 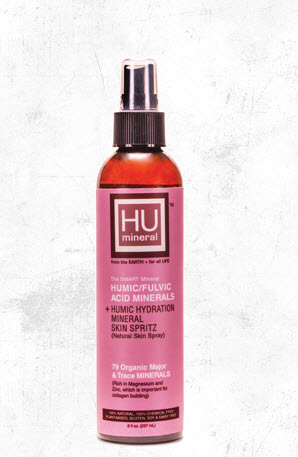 HUmineral™ Skin Spray is rich in Magnesium and Zinc, which is important for collagen building. It delivers other minerals, antioxidants, electrolytes directly to the skin, with organic major and trace minerals helping to improve the health of our largest organ system - the skin. What are Humates or Humic/Fulvic Acid Minerals? Naturally occurring plant nutrient minerals (organic soil matter), found 30+ feet below ground. These organic compounds are rich in polyphenols (antioxidants), life-giving electrolytes, and major and trace minerals. Humates carry 8 Major minerals (Calcium, Iron, Magnesium, Nitrogen, Potassium, Sodium, Sulfur, Zinc) and 71 Trace Minerals. HUmineral's Organic proprietary blend of Humic/Fulvic Acid Minerals, Spring Water. Derived from fresh water source. No chemical cleansing. Made in the USA. 100% Chemical Free. Plant-Based. Gluten, Soy and Dairy Free. May reduce signs of wrinkles, lines, and sunspots. Can use for tanning, insect bites, dry skin, rash, moisturizing, toning, and weathered skin. Reduces overall daily harsh life effects on the skin, promoting healthy glow to skin and a benefit to hair and total body. Can be sprayed multiple times per day, morning, noon, evening, after shower, before bedtime, or before/after makeup. Spray: Face, skin, hair, body.